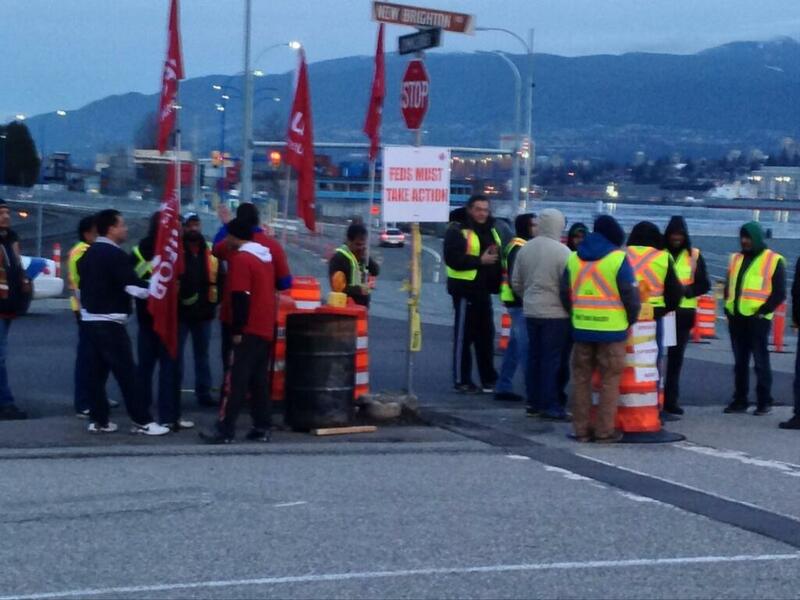 Both unionized and non-unionized truckers are now on strike at Port Metro Vancouver in Canada. 1,400 non-union drivers in the United Truckers Association went out on February 26, 2014. Up to 400 drivers from the Unifor-Vancouver Container Truckers’ Association went out today, March 10, 2014. Truckers went out on strike at Port Metro Vancouver this morning, after having voted last Saturday to reject a mediated back-to-work plan. They are joining non-union truckers who have been on strike since the end of February. Drivers from Unifor-Vancouver Container Truckers’ Association set up pickets at 9 locations around Metro Vancouver, including the main Port of Vancouver, Deltaport (which are part of the 4 terminal complex), and several trucking companies that move containers to and from the ports. 98% of the rank-and-file rejected the mediated settlement, fighting against the $15.59 an hour rate of pay for port truckers and contrasting it with the $23 an hour pay for the B.C. trucking industry. Those rates haven't changed for the last 8 years. Like most other west coast ports another grievance is wait times for trucks at the port, which can reach several hours. The 4 terminals in Vancouver take in 12.4% of all containers on the North American west coast, handling 2,000,000 containers per year, and truckers move cargo worth $885,000,000 in and out of the port's terminals every week. Major strike by truckers shut down the Vancouver ports in 1999 and 2005, the latter lasted 47 days and forced the B.C. government to re-regulate the industry and begin to phase out independent operator truckers. Port management says that the terminals are only working at 15% of capacity. The port authority has also gotten an injunction against strike activity on port property by union and non-union drivers, but they're maintaining their strike in defiance of that court order. Picketers stop trucks passing by, encouraging them to join the strike. Here's a mainstream news story from CBC News for British Columbia. An undertone of violence has crept into the port community that no one wants to speak about publicly, but all concede that it is happening. The few drivers who dare to continue working are followed by strikers, and when they are out of sight of security, the vehicles are pelted with rocks and sometimes the drivers are pulled from the cabs and beaten. The port authority, along with the provincial and federal governments, are therefore attempting to broker an immediate solution to end the violence and keep the terminals from shutting down, while at the same time developing a long-term solution. Vancouver handles about 2.5 million TEUs a year at four container terminals. Retailers earlier this year indicated that Canadian ports could see a bump in cargo this summer if contract talks in the U.S. between the International Longshore and Warehouse Union and the Pacific Maritime Association break down this summer as they did in 2002. This would show that the strike is spreading. In 2005, the trucker strike at Port Metro Vancouver lasted 47 days. This time they're refusing to negotiate, even PMV's 14-point proposal, until truckers return to work. But this blackmail strategy might backfire, because they're refusing to renew port licenses that expire around now, in addition to threatening to revoke existing licenses. Which creates a paradox, because how could truckers return to work without licenses. This threat is being made to the Unifor-Vancouver Container Truckers’ Association, the 400 or so unionized truckers, as well as the 1000+ non-union truckers in the United Truckers’ Association. With few signs of striking truckers and Port Metro Vancouver reaching a deal, the provincial government of British Columbia said it will introduce back-to-work legislation as soon as March 24. The 90-day cooling off period would only affect the 250 union drivers belonging to Unifor, and not members of the United Truckers’ Association who are mostly owner-operators. The strike has entered its third week, reducing truck traffic to 20 percent less of the normal volume and spurring shippers to divert cargo to other ports. Lastly, some of the chaos in Canadian logistics is a west coast shortage of containers, truck chassis, and trains cars due to cold weather tying them up in the east, bottlenecks on rail lines due to prioritizing the shipments of crude oil (from tar sands? ), and bumper crops of grains that are sitting idle in grain elevators. The Canadian government just passed new rules to double the amount of train cars devoted to transporting grain -- mostly bound for Japan and other Asian markets. Which shows how the struggle over the Just-In-Time grain loading port in Longview was part of the same struggle over control of these grain supply chains. Canada Sets Rules to Lift Grain Shipments to U.S. It would be great if there were solidarity actions at the ports of Seattle and Tacoma, refusing to handle the "scab" cargo diverted there in solidarity with the Vancouver truckers. Striking truck drivers late yesterday reached an agreement with Port Metro Vancouver, the federal government of Canada and the provincial government of British Columbia to end the 28-day strike that has wreaked havoc at Canada’s busiest port. The agreement that was reached with Unifor, which represents about 250 unionized drivers, and the United Truckers’ Association, which represents about 1,000 owner-operators, contains some cutting-edge proposals which, if implemented successfully, could have implications for busy U.S. container ports that face similar issues involving marine terminal congestion. Innovations include reimbursing truckers who must wait in long lines at terminals, and development of a common truck reservation system for the harbor. The agreement will also establish a framework for extending gate hours at marine terminals when warranted by traffic projections. Also, the agreement addresses more immediate demands for wage increases for drivers who are paid by the hour and owner-operators who are paid by the trip. There are assurances that fuel surcharges will be passed on entirely to the drivers who own and operate the trucks. The agreement pledges to step up enforcement mechanisms to prevent trucking companies from undercutting these provisions. “We wish to sincerely thank our customers and commercial stakeholders for your engagement during this difficult operating period,” said Katherine Bamford, director of trade development at Port Metro Vancouver, to the port community. Time is of the essence in making good on the provisions in the agreement because, after four weeks of significantly reduced truck service, containers have backed up on the wharves. Some truck-dependent cargo destined for the Vancouver area has been diverted to Seattle and Tacoma. It also appears that the agreement will reduce the threat of sanctions and penalties for drivers that had refused to heed earlier demands by authorities that the drivers return to work. The agreement also suspends an effort by the British Columbia government to consider legislation that would have ordered the truckers back to work. Additionally, the agreement has resulted in compensation and other benefits for drivers that exceed those offered in the original 14-point action plan the port and the government agencies released on March 13. That plan did not result in any significant return to work by the drivers. Traffic flows changed from day to day, sinking as low as 10 to 15 percent and occasionally exceeding 40 percent of normal.